One way to quell your wanderlust (albeit if briefly) is to embrace the lovely history, architecture, hidden gems or just general quirkiness of your own city or town. 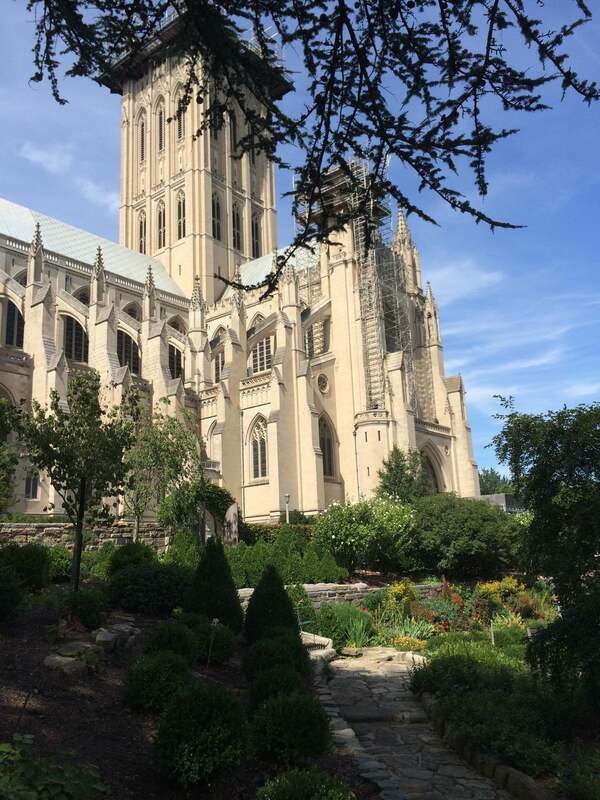 As much as I adore Washington, DC, I am the first to admit that I’ve probably taken for granted the many treasures that are right under my nose or in the case of the National Cathedral, towering above my head. Well, no longer! Going forward, I am going to embrace being the nerdiest of tourist right here in my own town. First up, a behind the scenes tour of the one of our nation’s most well known places of worship. 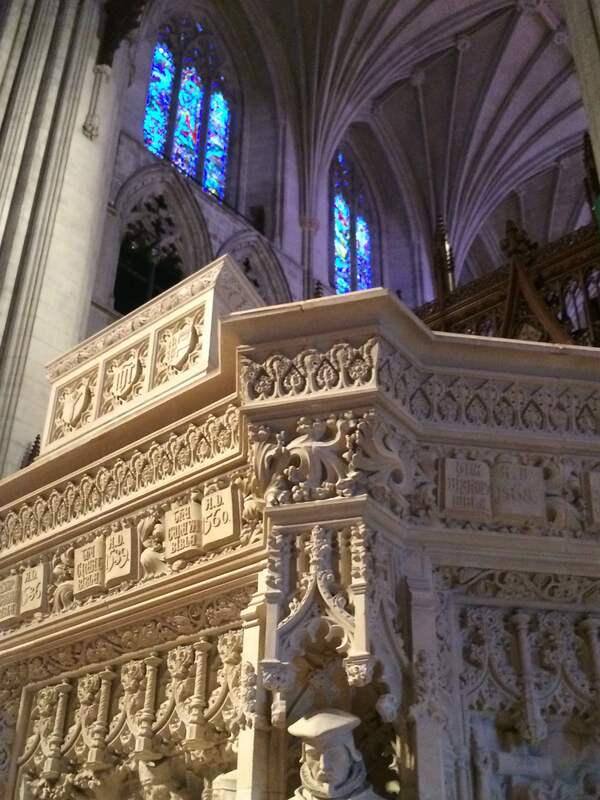 Whether you are from the US or from afar, you’ve probably seen the interior of the Cathedral Church of St. Peter and St. Paul, better known as Washington National Cathedral, during one of the televised presidential funerals or inaugural prayer services. Or perhaps you are more familiar with the historic photos of Martin Luther King’s last Sunday sermon held at the cathedral in 1968. 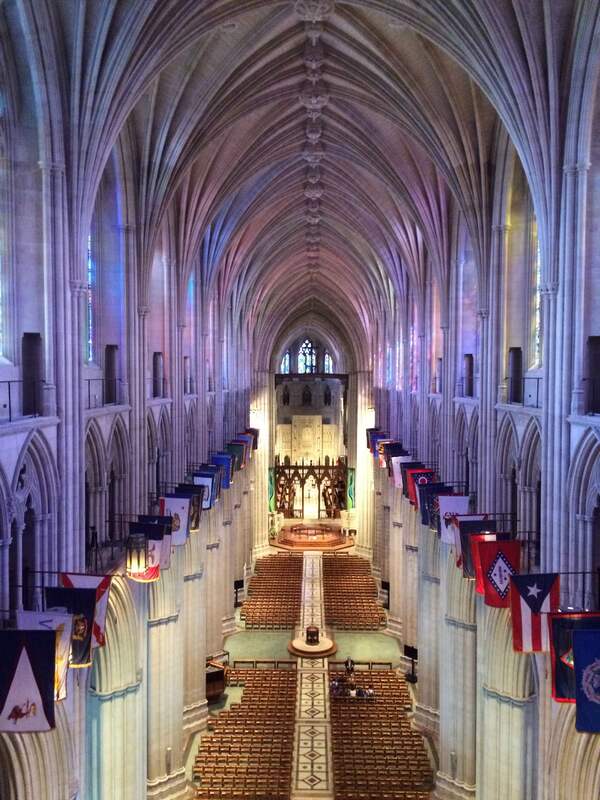 View of the Cathedral Nave aligned with the state flags. A much abbreviated history: In the late, 1790s, on commission from General George Washington, Pierre L’Enfant (yep that guy had his hands ALL over shaping the design of Washington, DC) was first to include a “great church” in his visionary plan for DC. It took some time for the idea to catch on. The first stone was not laid until 1907. Eighty–three years, four architects, many presidents and countless stages of construction later the Gothic style structure was finally completed in 1990. I thought I knew most of historic details of the cathedral but my tour was full of surprises. Very early on in the tour it became obvious that there were many interesting historic tid bits about the interior that are not widely know or easily seen from afar. I’ll try to reign in my inner history geek and not recap everything that I learned and provide you with a few morsels to tied you over until your visit. Flags from all 50 states line the walls of the nave and each Sunday one state flag is prominently displayed at the alter while that state receives a special prayer. 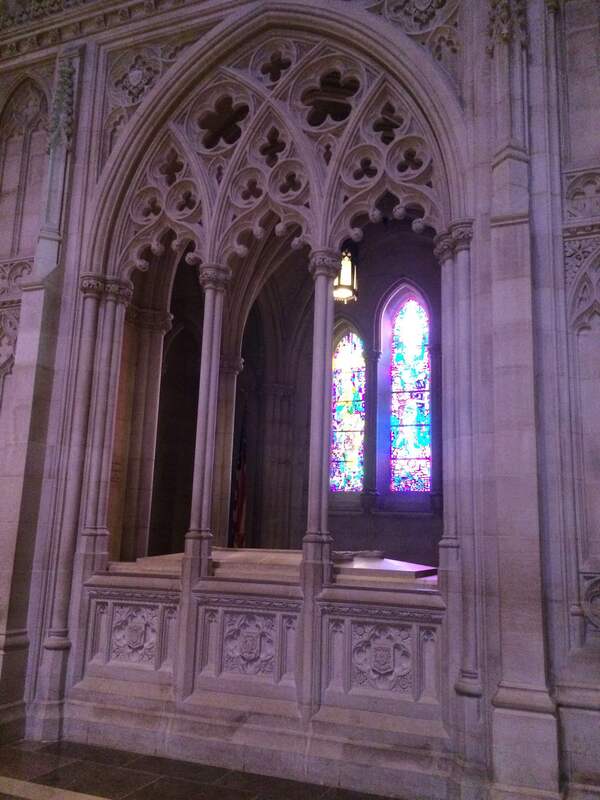 28th President Woodrow Wilson, interred in stone casket in the nave, is the only US president buried in the District of Columbia. Also buried in the cathedral is Presidential Medal of Freedom awardee and activist Helen Keller. The stained glass Space Window holds in its center an actual piece of lunar rock and was dedicated on the 5th anniversary of the Apollo Moon Landing. 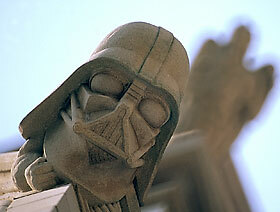 Yes, the rumors are true; there is an actual Darth Vader gargoyle in the west tower. Darth is there as a result of a national competition for children during the 1980s. As you know the force was strong with all of us in the 80s. There is a Gargoyle Tour offered at the cathedral. Bring your binoculars. 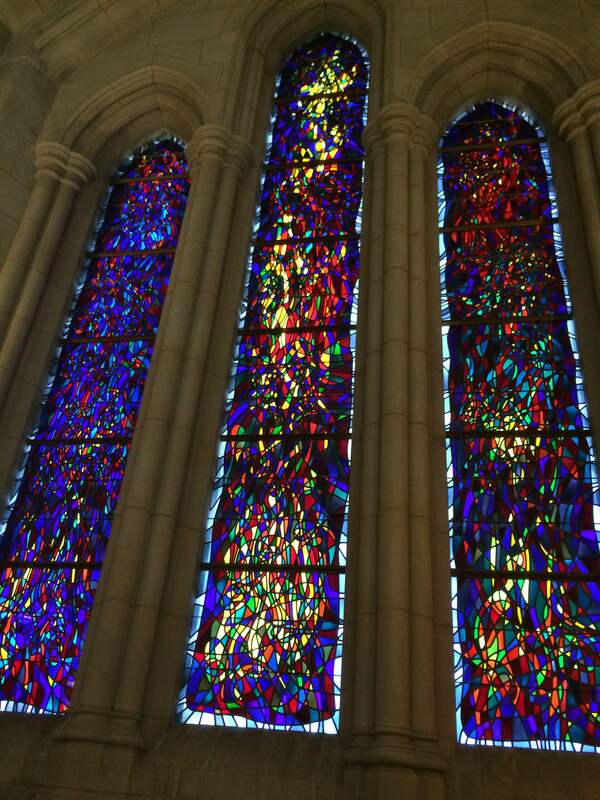 Photo cred: National Cathedral. The Churchill Porch dedicated to dual US/UK citizen Winston Churchill. 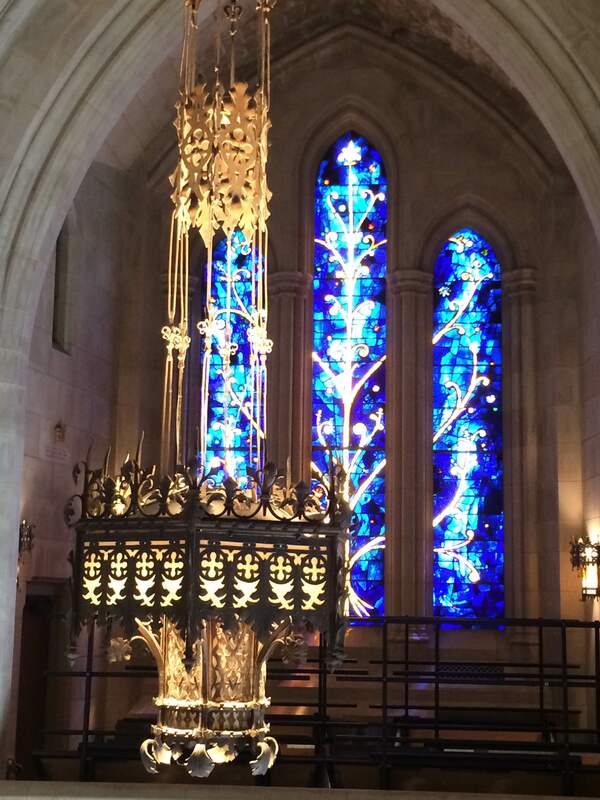 The blue and yellow stained glass reflecting his favorite colors. 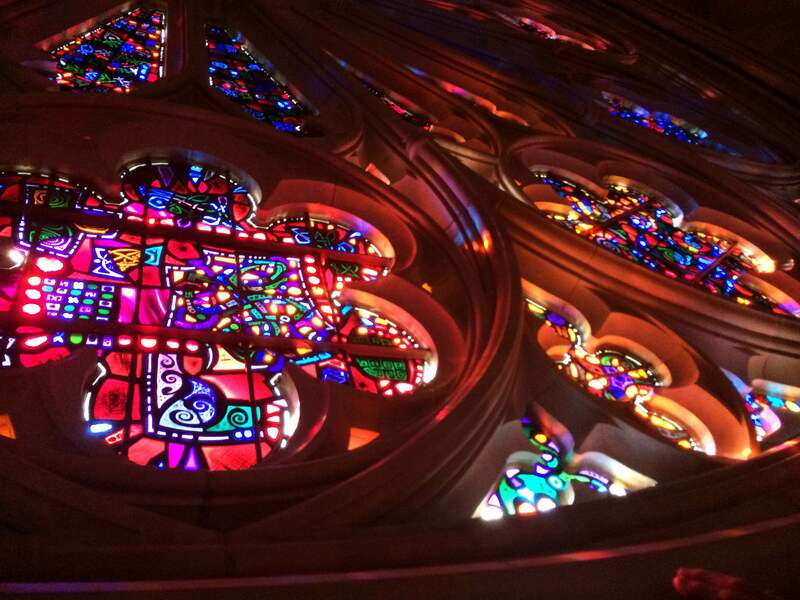 The behind the scenes tour provided amazing up close views of some to the magnificent stained glass high above the cathedral floor and the beautiful west rose window. After the tour I wandered around the property to the Bishop’s Garden and then to cafe on site. In doing so, I discovered two new favorite places in the city. Don’t skip either if you decided to visit the cathedral. 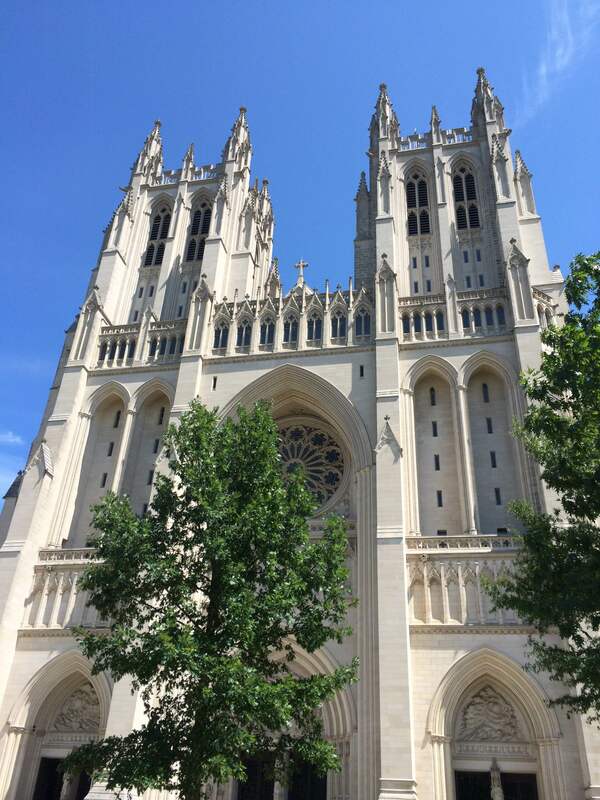 Washington Cathedral offers many options to explore the cathedral and grounds. You can take a free self guided tour, an in-depth tour followed by traditional English Tea or any number of specialty tours. If you are so inclined, there are a number of carillon and choral recitals each season. 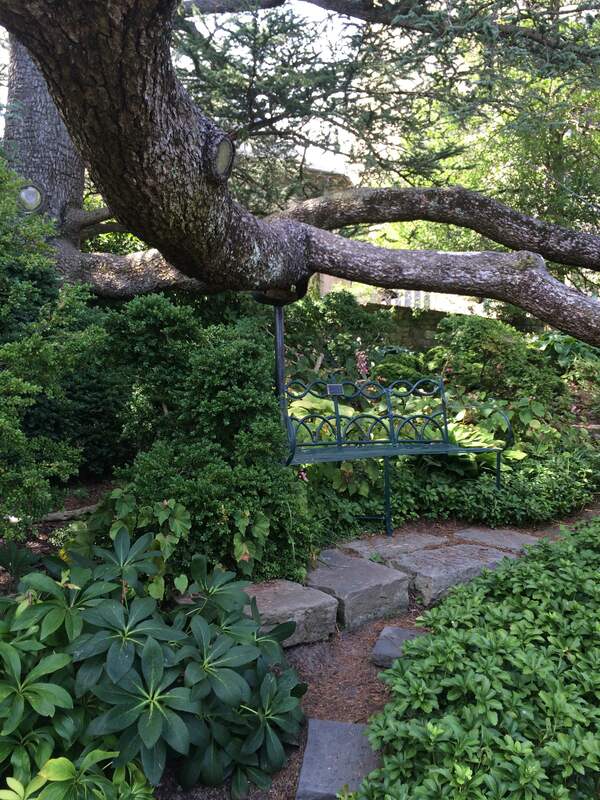 Plan your visit here and be sure not to miss the Bishop’s Garden. Enjoy! Very, very nice! The youngest Bees have been reading about the Romanesque and Gothic styles of the Middle Ages. I’ll have to share this with them. We will definitely be visiting the Cathedral on our next trip! Thanks for sharing the bit of history with us. Yes, for sure. Pretty cool to see it up close and so much more history shared on the tours. The Bees will enjoy it.